In this article I'm going to write about the Thinglink360 video shown below, created by Kevin Hodgson, a middle school teacher from Western Massachusetts, and more than 20 other people starting in February 2018. Then I'm going to write about this cMap which I created this week, inspired by the project Kevin is describing. I hope you'll follow along and see the connection. See Interns w T/MC cMap at this link. 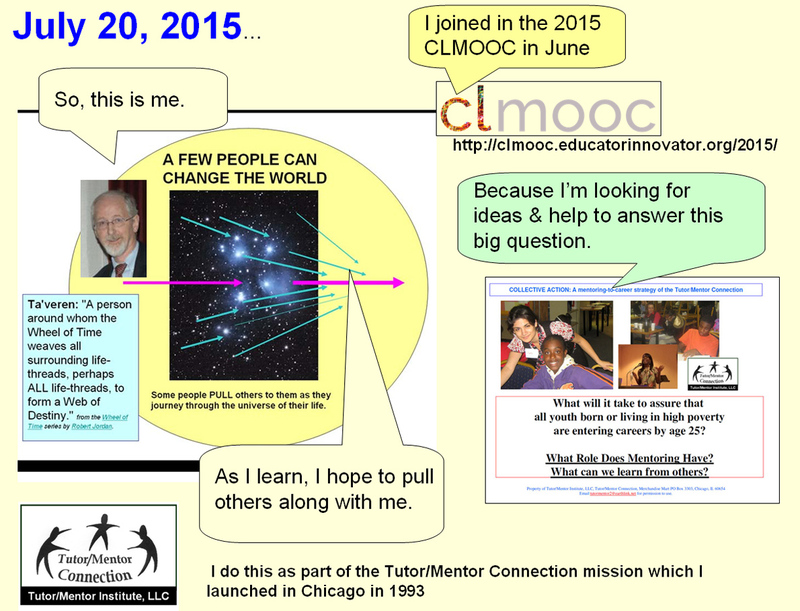 I first met Kevin in 2013 as part of the Connected Learning #CLMOOC, and have grown to appreciate and value the ideas he shares on his blog. Thus, I visit often. So in early April I opened this article, which was the first of a three-part reflection under the title of "Creating a Virtual Gallery of Digital Art". It all started about three months ago (mid February?) when Kevin got an idea. "What if the (open and university) folks dabbling in Networked Narratives (#NetNarr) together created a collaborative piece of trans-media artwork together?" Kevin brainstormed the idea with a few other on-line friends and soon created this site as an invitation for others to join in the fun. He titled this the NetNarrAlchemyLab. In his blog Kevin wrote, "Early on, we had a vision of an immersive virtual lab that visitors could wander around in, like a museum." He went on "We wanted to create a "doorway" in and a "doorway" out. Over six to eight weeks 20 people from different parts of the world (Australia, Scotland, USA, France, etc) created more than 50 projects. The project began with a group from the #NetNarr ecosystem, but soon spread to folks in the #DS106 and #clmooc groups. If you open the AchemayLab you can click into each of these projects. I encourage you to visit Kevin's blog and read his description of what worked, what did not, and see how he keeps drawing attention to the work he and others have been doing. 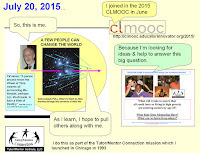 As I said, I've been engaging with the #clmooc world for five years and have shared some of these interactions using graphics and concept maps posted in more than 30 articles. 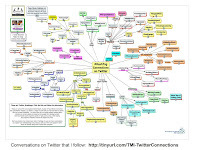 I've watched Kevin and many others from several on-line communities connect with each other and amplify the work they are each doing via their own blog articles, Tweets and Facebook posts. The motivations for these interactions are many. 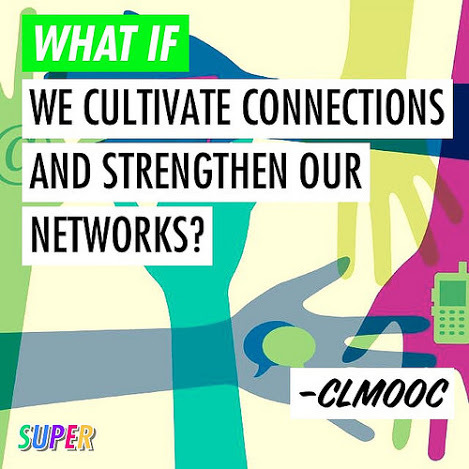 For instance, if you visit this #clmooc home page you can see how such interactions have been stimulated in that group. 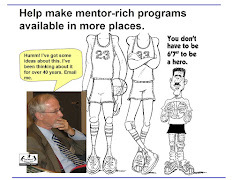 As you do you'll see a few examples of where I've tried to draw members into the work I've been doing since 1993, helping non-school tutor/mentor programs reach k-12 youth in high poverty neighborhoods. I liked Kevin's description of his goal,"to create an immersive virtual lab that visitors could wander around in, like a museum." That's the way I think of the web library I've created, and it communicates my own goal that people come in, wander around, do some reading, then share what they see with others. 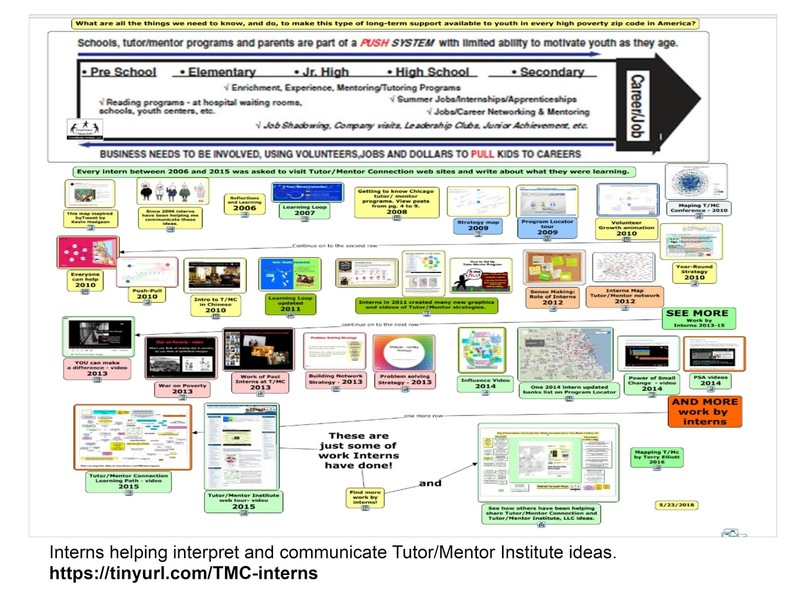 As I looked at the Thinglink360 I wanted to create something similar to show work interns have done while working with Tutor/Mentor Connection and Tutor/Mentor Institute, LLC between 2006 and 2015, with the goal that some of these educators would duplicate these intern efforts and for the same purposes. Since I don't have a paid account with Thinglink (or the talent) I could not do what Kevin did, so I used my free cMapTools account and created the concept map shown above. 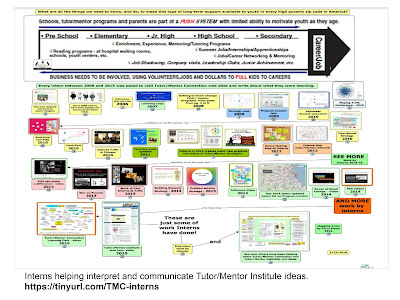 Each graphic on the cMap comes from a project done by one of the many interns who work on the Tutor/Mentor Connection/Institute, LLC project. 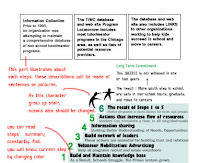 Below each graphic you can find one or more links that open blog articles and/or videos that show the project, or show how the project was created and how I coached the interns along the way. As I spent time last week reviewing work interns had done to collect images and links for the cMap I was reminded again of the immense talent of the students who worked with me. More than half came from South Korea and Hong Kong, while most of the others were from Chicago area universities. 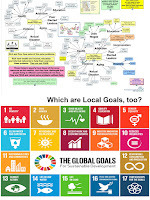 Much of the work being done in these on-line communities focuses on "cultivating connections" and "strengthening networks". 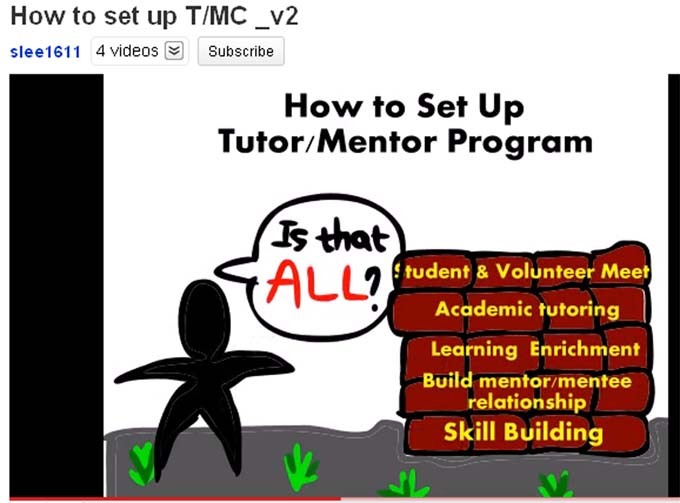 My goal is to draw people from the non-school #tutor #mentor, youth and workforce development and anti-poverty ecosystems together in similar on-line communities...and to connect them with the people and networks I'm already following. As participation grows I hope to recruit a few people from different places who will spend time building their own understanding of what I've been trying to do. I hope some then begin to duplicate my own 25 year history, by creating libraries of content, and recruiting students from as early as middle school to spend time reading, reflecting, hacking and re-making work that I and my interns have done, to mobilize the time, talent and dollars of more people to help kids born or living in high poverty areas get the extra adult support they need to not only move successfully through school, but to have help moving into adult lives with jobs and careers that enable them to raise their own kids in any place they choose. In many of the links on the cMap, like this one, I show how interns created their own projects after reading PDF essays, or blog articles, that I've written. That represents more than 1000 articles, a mountain of content and ideas, that educators and social innovators from all over the world could draw from. Throughout this and other articles I've included #hashtags with links to Twitter. If you open these and scroll through past Tweets, you'll open yourself to a wide network of people and ideas. For instance, here's a Tweet Kevin posted to draw attention to one of the projects in the Alchemy Lab. 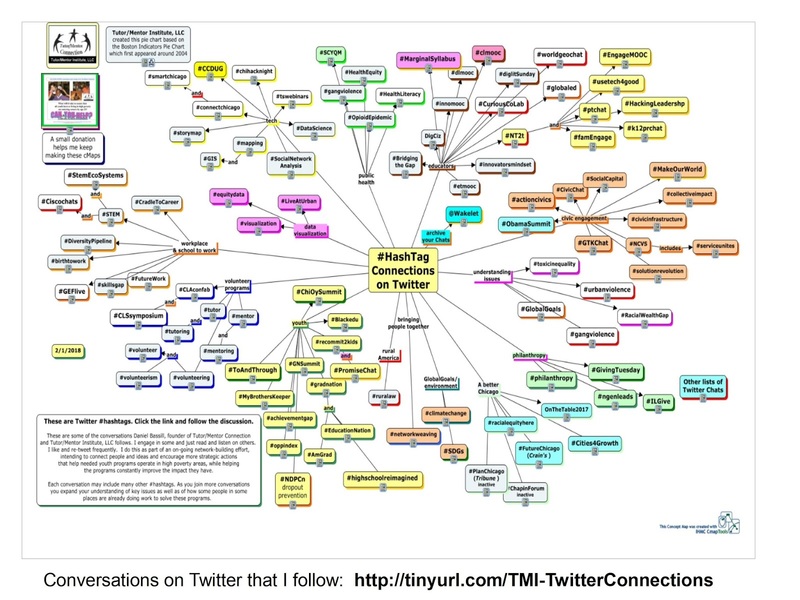 In another cMap I've been aggregating links to Twitter conversations I've been following. My vision is that at some point in the future I could find Tweets within each of these groups, pointing to my articles and work interns have done with me in Chicago, with new visualizations, videos, articles, etc. 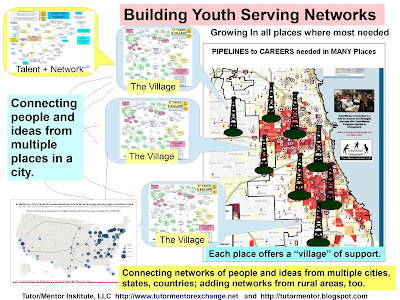 that apply those concepts in Chicago neighborhoods, or in neighborhoods throughout the world. 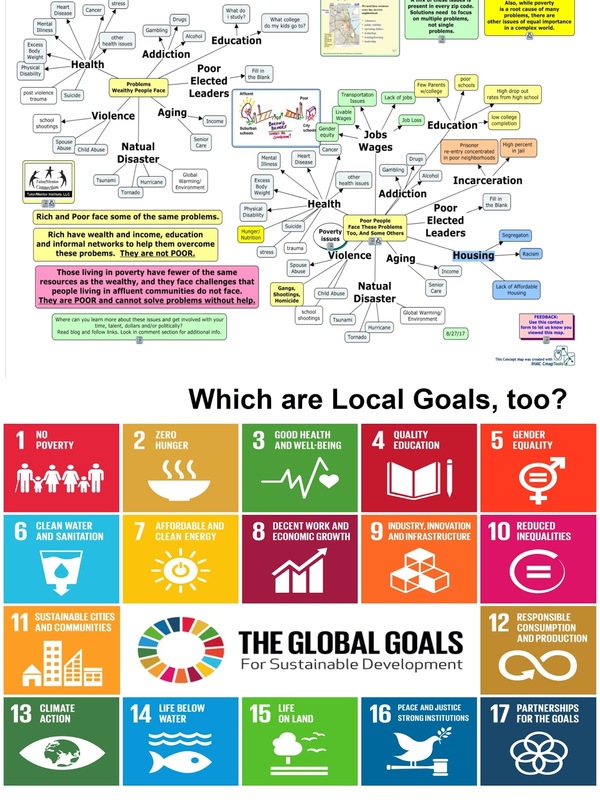 Furthermore, while my articles focus on helping kids living in poverty connect with extra adults and learning via organized non-school programs, this graphic visualizes a wide range of complex problems that need to be concurrently addressed in Chicago and throughout the world. The "how do we do this" needs many people's ideas and what better way to communicate those than through the type of work Kevin is describing and that I've been trying to do. Finally, if you are re-making and hacking the ideas I share, let me know. 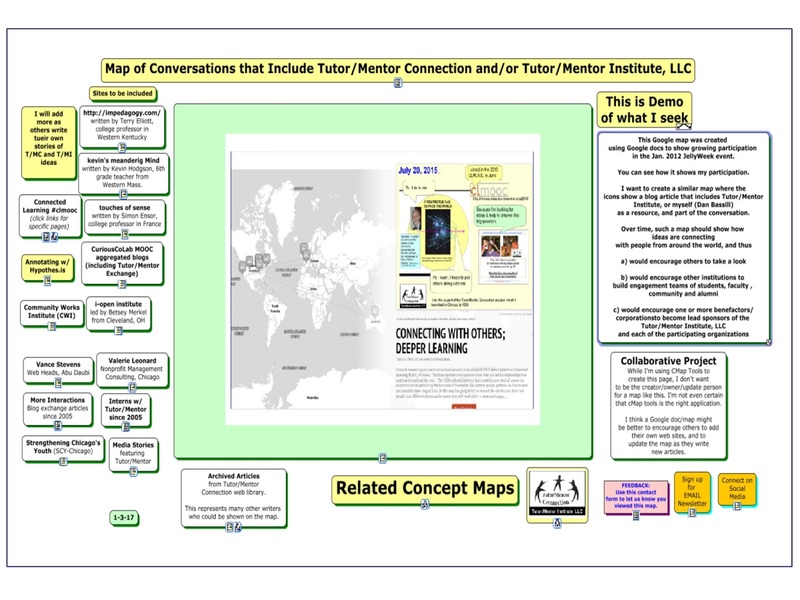 In the lower right corner of the intern map, you'll find this map, shown below, which I'm using as another 'museum' that showcases others who are already helping share Tutor/Mentor Connection/Institute, LLC ideas. I'm at @tutormentorteam on Twitter and you can find me on Facebook and LinkedIN too, I hope to connect and that you'll share with me some work inspired by what I'm writing about. Maps surface connections and ideas, and the Lab project is a map (as you note and then use ... although to be fair, you've been using maps and concept projects for quite some time to make visible that which is sometimes hidden). Thank you for sharing your work and for reflecting how one project can influence another, which is really what this is all about. That, and making the world a better place.